With educators and local medical professionals from across the Roaring Fork Valley presenting, the hands-on event taught students basic life-saving techniques to utilize in the event of an emergency. Presenter Jen Elias, who also serves as Valley View Hospital’s trauma coordinator, first stressed the importance of dialing 911 or specifically instructing someone else to do so. Although such a task may seem like common sense, all-to-often panic causes people to take longer to call emergency responders, and subsequently delay professional medical help from arriving on scene. “The only thing more tragic than a death, is a death that could have been prevented,” Elias said to students, echoing one of Stop the Bleed’s mottos. Instead of diving straight into how to prevent life-threatening bleeding to the greatest extent possible, Elias made sure students understood that they should not offer help, until they could ensure their own safety first. Students were then shown images of what life-threatening bleeding looked like and given instructions on how to handle the various situations accordingly until emergency medical personnel did arrive. GSHS seniors Hanna Spencer and Telford Underwood said that they never envisioned learning about how to prevent a classmate, teacher or even a complete stranger from possibly bleeding to death, But they said they certainly understood the importance of Wednesday’s Stop the Bleed assembly, particularly in this day and age. “It’s becoming a lot more relevant now and this is a big eye opener as to how relevant it is in our society and contemporary times.” Spencer said. After making sure 911 was called, ensuring their own safety and identifying life-threatening bleeding, students learned how to use a first aid trauma kit, and what to do if one is not readily available. Local ER doctors, trauma surgeons, paramedics, EMTs and even Classic Air Medical’s flight crew gave students hands on training on how to stuff wounds with gauze or a clean cloth and looked on as students applied pressure to life-threatening bleeding simulations. Additionally, the medical professionals taught and reinforced how to utilize devices such as tourniquets around arms and legs. “It has been a valley-wide collaborative and people from all different professions have gotten involved,” Elias said of bringing the national Stop the Bleed campaign to the local area. Without question, tragedies such as the Columbine High School massacre, the Sandy Hook Elementary School shooting and the Marjory Stoneman Douglas High School shooting come to mind during Stop the Bleed assemblies. However, the national campaign teaches students critical, life-saving techniques they may apply in a variety of emergency circumstances. “Could it happen in a school? Absolutely. Could it be a shop class? Absolutely. Could it be at a ball field? Could it be anything?,” inquired Glenwood Springs High School Assistant Principal Patrick Engle. For the second time in five months, the Colorado Medical Board has issued a cease-and-desist order against an Aspen man who has branded himself as a medical doctor although “there exists credible evidence” he lacks the proper credentials. On Thursday, the board put Hassen Dagher, 45, who once ran a fitness studio in Aspen, on notice that he is forbidden from practicing medicine or representing himself as a physician in the state of Colorado. The board delivered its first cease-and-desist order against Dagher on Dec. 20 but said he has ignored it. “From approximately April 1, 2019 to present, (Dagher) continues to represent himself as a physician on a LinkedIn profile, although (Dagher) is not licensed to practice medicine in the State of Colorado,” said last week’s order. Should Dagher continue to ignore the order, the matter will be referred to the state attorney general for injunctive relief, according to Paula Martinez, program director for the Colorado Medical Board. Dagher on Tuesday referred questions to a Denver law firm that he said is representing him in the matter. The firm could not be immediately reached for comment to confirm it has been retained. Dagher also provided to The Aspen Times, by email, an image of a certificate he received from the Educational Commission for Foreign Medical Graduates dated June 7, 2015. Certification from the ECFMG helps medical graduates from outside the U.S. obtain certifications to practice in the States. According to the December order, however, Dagher “engaged in the unlicensed practice of medicine” starting July 5, 2016. The order cited his July 5, 2016, appearance on a Grassroots Community Network program where he said he was a physician with a medical degree from St. Matthews University School of Medicine in the Cayman Islands; his LinkedIn page describing him as a “skilled physician;” and his testifying that he was a doctor, during an October civil trial in Aspen. During the citizen comments portion of a March 6, 2017, Aspen City Council meeting, Dagher referred to himself as a doctor and pitched to elected officials the creation of a “fitness czar” who would help the local populace get or stay healthy through programs and other means. The proposal failed to take flight. As of Tuesday, Dagher’s profile on LinkedIn, a social media site for professional networking, said he has a medical practice in Aspen. He previously ran Aspen fitness studios including Dagher Fitness, whose offerings included personal training, yoga and rehabilitation. Richard Miller’s admission shortly after the Lake Christine fire broke out July 3 that tracer bullets were fired from a rifle at the Basalt shooting range cannot be used in a trial against his girlfriend, a judge ruled Tuesday. Eagle County District Judge Paul Dunkelman said Miller’s comments about the type of ammunition and his knowledge of a fire ban in place last July represent what Miller knew, but not necessarily what Allison Marcus knew. The comments made by Miller would be prejudicial against Marcus in her trial, the judge said. Miller’s comments can be used in a separate trial against him, the judge ruled last Friday. Miller’s attorney, Josh Maximon, had filed a motion to suppress the comments, but it was denied. Miller can also be called as a witness in the trial of Marcus, the judge indicated. Miller is scheduled to go to trial May 28. Marcus is scheduled to go to trial June 17. The defendants, both 24 years of age, are facing three counts of fourth-degree arson, a Class 4 felony, and one count of setting fire to woods or prairie, a Class 6 felony. They were arrested July 22 and are free on a $7,500 bond each. An affidavit in support of an arrest warrant for the couple and testimony in a pre-trial hearing last week showed that Miller and Marcus went to the Basalt shooting range late in the afternoon of July 3. The fire broke out behind the shooting range, and Marcus called 911 to report it, according to her comments to investigators. Eagle County deputy sheriff Josiah Maner testified Wednesday he arrived on the scene shortly after the fire broke out and was talking to another law enforcement official when Marcus volunteered information. “Ms. Marcus kind of approached us and said she was responsible for the fire and was extremely sorry,” Maner said. Miller said he was shooting a shotgun with birdshot. Marcus said she was shooting a rifle that they had picked up from Miller’s father. Maner said he asked Miller what kind of rounds were being fired from the rifle and that Miller said he didn’t know. A short time later, Maner asked Miller if he could check their equipment, including a container for ammunition. Miller replied, “Well, if I can be honest, it was tracer rounds,” according to Heidi McCollum, assistant district attorney in the 5th Judicial District Attorney’s Office and a prosecutor in the cases. The arrest warrant affidavit also said that Maner asked Miller if he was aware that a stage 2-fire ban was in place at that time. In his testimony last week, Maner said he told Miller and Marcus it was their responsibility to know that incendiary rounds such as tracers were prohibited during the fire ban. Marcus’ attorney, Stan Garnett, indicated in court last week he would attempt to show in trial that Marcus didn’t have the state of mind to commit the crime. The majority of Basalt residents want a refund for property taxes the town government overcharged, according to results of a town survey. The majority also don’t want Town Hall to lay a guilt trip on them about how a refund will require a reduction of services, according to Bill Ray, principal in WR Communication Inc., a survey firm that has worked extensively in the Roaring Fork Valley. The survey allowed respondents to provide open-ended comments. “There were a lot of (comments) ‘I just want my money, I just want my money,’” Ray said. Several respondents didn’t make a connection between the refund or a reduction of the tax rate with a decrease in services, according to Ray. “There was general pushback — don’t hang reduction of services over our heads,” he said. The survey results that he unveiled at the regular council meeting Tuesday night dropped like a political bomb. Not only do residents want a refund, it’s a toss up on whether they will let the town maintain the current mill levy. Respondents also questioned the effectiveness of the leadership of the board. The town commissioned the survey after the current administrative staff discovered that the property tax rate was increased 10 times since 2005. The staff reported the discovery to the council in a closed session. The council directed them to share the information with the public. The overcharge is an apparent violation of Colorado’s Taxpayers Bill of Right or TABOR amendment to the constitution. Basalt residents voted in 1992 to ease restrictions of TABOR, and it appears that was mistakenly interpreted by former and some present town officials to mean property tax rates could be increased without a vote of the people. In reality, it meant excess revenues could be kept when property values increased and taxes raised more funds. TABOR says that tax entities that violate the law are liable for refunding revenues collected for the most recent four years. Basalt officials estimate the cumulative refund amount would be about $2.3 million. The challenge, Town Manager Ryan Mahoney said prior to the meeting, is how to provide that refund without crippling the town financially by drawing down reserves, drastically cutting service or a combination of the two. While WR Communications didn’t have the time to conduct a scientific sample, Ray told the council there was a strong response rate to the survey sent to 1,529 households. The town received 282 responses from a mixture of older and newer residents as well as from residents of Eagle and Pitkin counties. The town falls into both counties. Nearly 39 percent said set the mill levy at the current rate to maintain the level of services. It was evenly divided with 42.55 percent saying yes and 41.49 percent saying no. About 16 percent were unsure. Councilman Auden Schendler said the town government needs to provide information that reflects the reality of the situation. He said the word “refund” should be avoided and replaced with a phrase like payment from reserve. Whitsitt expressed frustration that several years of property tax reductions have been forgotten in the discussion. Between 1994 and 2010, Basalt reduced or maintained the property tax rate nearly every year. The rate has increased 10 times in the 14 years since 2005. The tax issue will be on the council’s plate throughout June and July. Mahoney said the staff would return with recommendations on questions for the November ballot. Whitsitt said she believes there must be two questions — one on maintaining the mill levy at the current level for the future and the other on whether or not a refund should be given for the overcharge. If there was any silver lining, it was that some residents credited the town with transparency on the issue. The town staff brought the overcharge issue to the council’s attention. Mahoney has been manager for less than two years. The finance director and attorney are new this year. However, Ray said that respondents “do not separate current Town Council/staff from past years.” They lump government past and present together he said. A week before the shuttle to Hanging Lake kicks off, more than 8,000 people from all over the world have purchased passes to take the hike up to what has become one of the region’s most popular spots. Hanging Lake was something of a local secret until recent years, when its popularity became so great that the U.S. Forest Service began raising alarms that the thousands of human visitors were damaging the fragile ecosystem. After the Forest Service counted more than 150,000 visitors to Hanging Lake in the summer of 2016, it began developing a system to manage access. From May 1 to Oct. 31, the only way to access the trailhead by car is a shuttle leaving from the Hanging Lake Welcome Center near the Glenwood Springs Community Center. The reservation costs $12, but until April 30, an “early bird” reservation to bike to the trailhead in Glenwood Canyon is available for $9.50. Ken Murphy of Glenwood Adventure Company is part of H2O, a collaboration of local businesses and professionals who were hired by the city of Glenwood Springs and the Forest Service to manage the new system. A total of 8,639 people have booked their chance to hike Hanging Lake at some point this summer since the reservation system at VisitGlenwood.com launched April 1. Of that number, 1,335 people have booked their spot to make the hike after biking to the trail, and avoiding the shuttle. 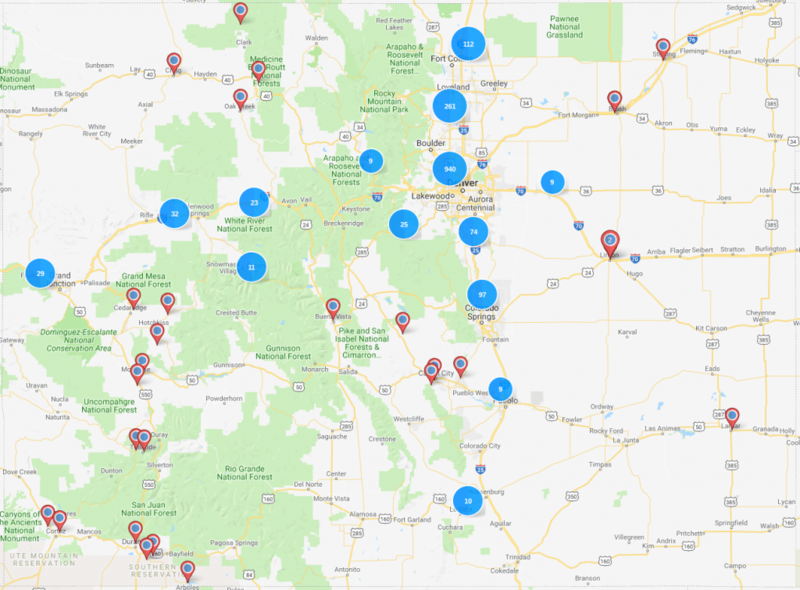 Where are Hanging Lake visitors coming from? People from all across the U.S. have booked reservations, and others have paid for the chance to visit from Australia, China, Thailand, Israel, and several countries in Europe. Illustration of reservations to visit Hanging Lake during the summer of 2019 from across the world. Image courtesy of H2O. 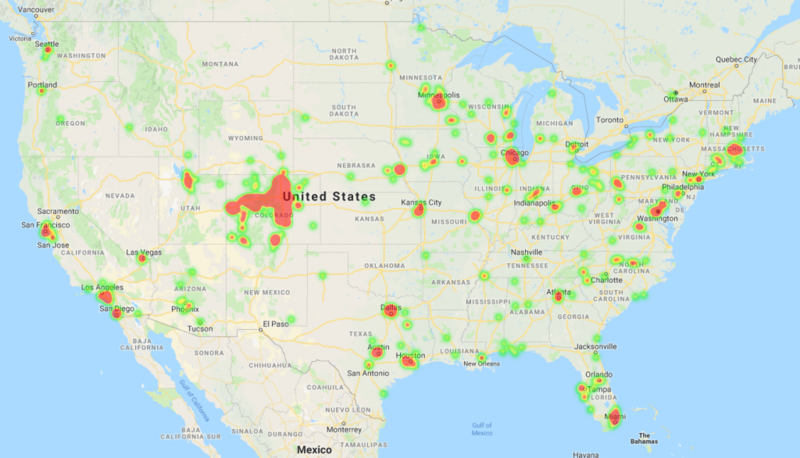 Heat map shows which states have the highest concentrations of reservations to visit Hanging Lake. Green indicates a few reservations, red means high concentration of reservations. Image courtesy of H2O. The vast majority of reservations have come from the Front Range, which is the primary market for other Glenwood Springs tourist attractions, Murphy said. The number of Hanging Lake reservations by geographical region in Colorado. The total number of reservations is for the entire summer, not any specific day. Image courtesy of H2O. While 8,000 may seem like a big number for the small lake at the top of a short trail, those visitors have booked spots throughout the summer. The maximum number of visitors per day is 615, but the shuttle will only take, at most, 44 people each trip about every 45 minutes. As people hike at different paces, they will naturally spread out. Murphy said it’s unlikely there will be large clumps of people heading up the trail. “The way we’ve set up the system creates a better experience,” Murphy said. Compared to years past, when hundreds of people might be at the top of Hanging Lake on a busy day, the reservation system makes it possible to see only a few people at the lake itself. “There are certain times of the day where you might be there by yourself,” Murphy said. In just the past few weeks, the importance of a more hands-on management of Hanging Lake has been illustrated. Pictures of an apparent wedding celebration at Hanging Lake in mid-April circulated on a closed Facebook community group over the weekend, showing video of streamers scattered in the grass near the waterline. The reservations prove that Hanging Lake is not just a local gem, but a Colorado and national treasure, Murphy said. From June to August 2016, Hanging Lake had far more than 615 visitors each day, according to the Forest Service’s count. In May 2016, only six days saw fewer than 615 visitors. Most days were over 1,000. Murphy and H2O have made some adjustments to the process as they hear from people registering for this summer. For example, they won’t charge for an infant too young to walk — but that requires a call to the office. But the daily limit will stay in place. “The only thing that will never change is the 615 people per day limit,” Murphy said. H2O is finalizing the trail signs and getting the welcome center set up for next Wednesday. Murphy said they have been very conscientious about how to best educate hikers. The welcome center will not sell disposable water bottles, only refillable containers. And, with more interaction with Forest Service and representatives of H2O, hikers should be more prepared for the steep trail and any adverse conditions, he said. In the past week, the Glenwood Springs Fire Department was called to the trail for emergencies twice, according to Fire Chief Gary Tillotson. The details of the two incidents were unclear, but Tillotson said the trail conditions after the heavy snows had left slippery conditions. “Our guys on the last couple of trips definitely had to wear their traction devices, I can only imagine that some hikers had been injured as a result of those conditions,” Tillotson said. “I anticipate that, with this being the last weekend that no reservations or fees are required, it’s probably going to be a busy weekend for those who think that they’re going to get their last free trip up the trail,” Tillotson said. Glenwood Springs encourages residents to take advantage of the city’s household hazardous waste and paint drop off event this Saturday. The annual event will take place between 8:30 a.m. and 2 p.m. at the Glenwood Community Center’s upper parking lot, 100 Wulfsohn Road. The city asks that those wishing to dispose of either their household hazardous waste or paint to make an appointment ahead of time by calling (970) 945-5375 by Friday at 4 p.m.
“It’s a lot smoother the day of the event when people have an appointment and it’s not everyone dropping off something at 8:30 in the morning and waiting in a long line,” said Sarah O’Brien, executive assistant for the city. The city will not accept commercial hazardous waste, but rather hazardous waste from private parties only. While the service remains free for Glenwood Springs residents with proof of a utility bill or a valid driver’s license, those living outside of the city’s limits may still drop off their household hazardous waste items for $2 per gallon of liquids or solids, as estimated by an attendant. Accepted household hazardous waste items include: Aerosols, oil-based paints, latex paint, mercury, pesticides, flammable liquids, cleaners, acids, miscellaneous household solids, chlorophenoxy derivative acids, fertilizers, lead acid batteries, ni-cad/ni-fee batteries, batteries with mercury, antifreeze, gasoline, diesel fuel, and motor oil. Not accepted are: Compressed gas, oxygen cylinders, explosives, shock sensitive materials, ammunition, unknown materials, infectious or biologically active materials, dioxin, tri tetra and pentachlorophenol and their chlorophenoxy derivative acids, oxidizers, esters, amine and other salts. Additionally, Glenwood Springs residents wishing to drop off paint may do so for free with proof of a utility bill or a valid driver’s license. Those living outside of the city limits will be assessed a $1 per gallon handling fee, based upon the actual amount of paint as estimated by an attendant rather than the container’s size. Although the city will not accept commercial hazardous waste, it will accept latex paint and water-based finishes from contractors and commercial painters to recycle for a $2 per gallon fee — not by container size, but by actual amount of paint as estimated by an attendant. “The city will take care of the paint and household hazardous waste items and discard them appropriately,” O’Brien said. The city asks that participants not utilize containers larger than 5 gallons to transport paint or household hazardous items that they wish to dispose of. Basalt town officials and their consultants hope to get as many people involved as possible in the town’s first full-fledged master plan update since 2007. They welcome the foamers, they hope to attract the glazers, and they’re seeking ways to interest everyone in between. First and foremast, the master plan will help determine how Basalt looks and feels, what kind of character is possesses and what it needs to do to achieve that vision. It won’t solely be a land use document that dictates how many square feet can be constructed here and what types of uses can go there. “You can see how we’re really digging into a lot of different things,” said Henry. In addition to the website, the first public open house will be held Thursday from 5:30–7:30 p.m. at The Temporary in Willits Town Center. Town residents are encouraged to come in any time during that window to talk to the consultants, learn more about the process and share their thoughts. The process could be facing some challenges. First, although the town hasn’t completely overhauled its master plan since 2007, it undertook an extensive land use planning process for the former Pan and Fork property and other land downtown in 2014-15 .The exercise, headed by former town manager Mike Scanlon, was intended to build some level of consensus over what could be built on the Pan and Fork site and avoid land-use political fighting. It didn’t work. The town appears evenly divided over whether the site should oriented to have more development or more park. The fight has stretched into its seventh year with no certain path for resolution. Another challenge could be Basalt’s status as a bedroom community. An unrelated study called the Greater Roaring Fork Regional Housing Study found that 90 percent of Basalt’s 3,200 working residents commute to jobs outside of town while only abut 330 work and live in town. Basalt businesses provide about 2,250 jobs, but 85 percent of the positions are filled by people commuting into town, according to the housing survey. Meanwhile, housing prices continue to climb and make it difficult for the working class to gain a toehold in Basalt, as is the case elsewhere in the valley. The average existing house sales price is about $780,169 in Basalt. About 22 percent of Basalt’s total residential parcels are owned by people outside the region, the housing study said. In addition to Thursday’s event, there will be open houses on May 9 at Basalt High School and May 30 at Rocky Mountain Institute. All times are 5:30–7:30 p.m. Participants can drop in at any time during that window. There is no central presentation. The open houses are designed to be progressive, Henry said. So information collected at the first event will be used to dig deeper into issues for the second event. From a “who cares” perspective, Henry said, the master plan is supposed to provide a road map for Basalt’s direction for the next 10 years. So any one who believes they will be part of the community for the foreseeable future will want to get involved. It’s intended to steer public-sector programs and decisions by providing a framework for regulatory tools such as zoning, annexation and other policies. The criteria will be used to consider whether permits, drilling and spacing unit applications, and comprehensive drilling plan applications meet the bill’s mandate, according to Robbins. The comment period for the objective criteria opened on Monday, as residents across the state have the chance to review and voice their thoughts and concerns before the COGCC finalizes them. The criteria apply to applications for permits to drill, an oil and gas location assessment permit, a request to vent or flare permit, an intent to plug permit and more. It will also apply to pooling applications, drilling and spacing unit applications, and comprehensive drilling plans. Robbins said in the Monday statement that there is no moratorium. “All oil and gas permits or projects will not be put on hold, and there is not a moratorium on oil and gas permits in Colorado,” according to the release. Robbins visited the West Slope last week, as one of the presenters at the Energy and Environment Symposium in Rifle. When asked about the bill’s impact on Garfield County specifically, Robbins told the Post Independent that Garfield County has historically had good relationships with operators and he didn’t think the bill will make [the county] do things differently. “I think Garfield County had a lot of influence [when it comes to the new law],” she added. The Garfield County Board of County Commissioners voted unanimously Monday night to give Rocky Mountain Resources until June 1 to come into compliance with its county special use permit, or face further legal action. After a nearly three-hour public hearing, the time clock was set for the controversial quarry operation — currently proposed for a major expansion — to meet its existing obligations. • The quarry operated between Dec. 15 and April 15 the past two years, despite the special use permit prohibition on extraction during those months. • RMR conducted exploratory drilling, with a BLM permit, which was not part of the county’s special use permit. Commission Chairman John Martin made sure to clarify that the hearing was only on the current permit, and sometimes reminded speakers not to address a future expansion proposal. Many speakers urged the commissioners to immediately shut down the quarry or revoke the special use permit, arguing that RMR has already had more than two years to comply and apparently does not respect local rules. “I feel that RMR has not honored the conditions” of the special use permit, Samson said, adding that some of the conditions may be a little vague.